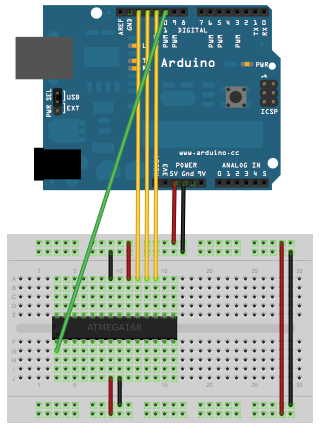 In the previous post we saw how to program an Arduino in standalone mode. One of the requirements was that the bootloader was already preloaded. But if we had a virgin Atmega328, or if we wanted to program our micro to be used without an external oscillator, what should we do? If you already have an AVR programmer, it is very simple, and I will not describe here, partly because not everyone has this accessory. So let’s see how to use our Arduino UNO as ISP programmer. Is said that with the UNO is not possible but in reality with a little trick, you can bypass the problem. Do not be discouraged if there are synchronization problems while uploading the bootloader, for every problem there is a solution … but let us see the procedure. First, I highly recommend you use the 0022 version of Arduino IDE. With version 1.0, I was able to upload occasionally and with difficulty. I would therefore advise to keep the two installations of the software installed. In un folder the 1.0 and in another the 0022. Both can coexist without giving discomfort with each other. 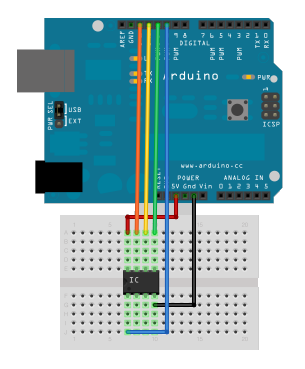 We must then connect as shown, pin 10 of the UNO to RESET pin of the Atmega, and pins 11, 12, 13 to pin 17, 18, 19 of the microcontroller (or pin 11, 12, 13 of another Arduino board ). In this scheme is not shown, but before we go further we must connect a 22uF capacitor between GND pin and RESET pin in the Arduino board, otherwise during the upload will take place an autoreset and the IDE will give you a sync error. At this point we can safely select the menu Tools -> Board -> Arduino Duemilanove or Nano w / ATmega328 and launch Burn Bootloader -> w / Arduino as ISP and if everything is done correctly we should have our bootloader loaded on the microcontroller , ready to be programmed via serial as shown in the previous post. Our Arduino UNO however, could be reprogrammed normally (remember to remove the capacitor previously inserted). Obviously we can not just load the bootloader on an standalone Arduino or on breadboard, but also on another Arduino UNO, 2009, Mini, etc.. But what if you wanted to program the board with minimal configuration without external oscillator? The procedure is slightly different because in default IDE Boards there isn’t a configuration of this type. Always remember to place 22uF capacitor between GND and RESET, and verify that the sketch ArduinoISP is loaded on our board. If all goes well, we should have our ATmega328 with Arduino bootloader loaded and running at 8MHz. In this way we can feed our final circuit with 3.3V (if you want), allowing a lower consumption of our project. If the upload at 16Mhz is successful and that at 8MHz no, it’s because the first upload of 8MHz bootloader needs to be done with the circuit still configured with external crystal, because if we remove the external oscillator, the circuit is not is able to communicate with the ISP programmer. Successively any further loading can be done without the external oscillator circuit. But for now we stop and we will continue to talk about in the next post.